Las Vegas Blog: Steve Friess' VEGAS HAPPENS HERE: Is Wi-Fi Now Free Throughout Aria? 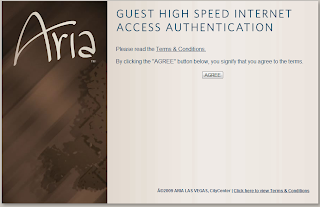 On the very same day that Liz Benston noted in the Las Vegas Sun that Cosmopolitan had decided to provide free wireless Internet without fees or resort fees, reader/listener John wrote in with some evidence that next-door neighbor Aria has unyoked its wi-fi access throughout the property as well. Just walked throughout the promenade at Aria, throughout the casino, and even into part of the convention center, and had a strong wifi signal throughout. It's all on the same free network. 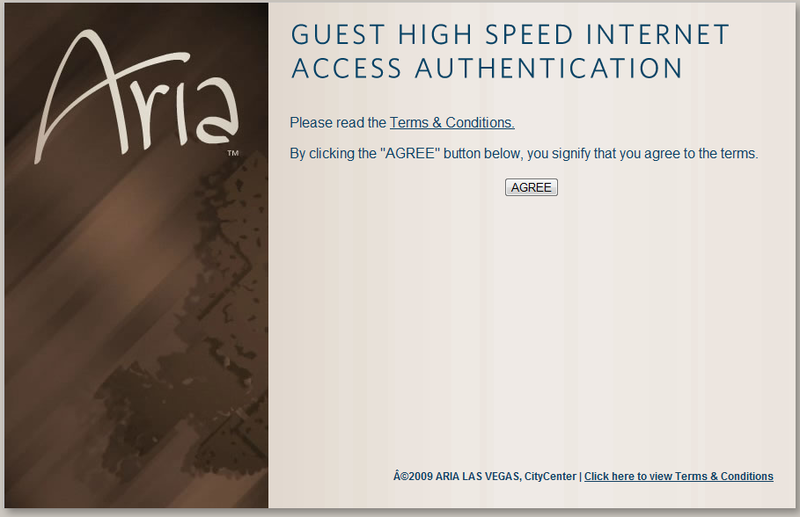 The name of the wireless network is simply "Aria". I couldn't get a signal at Bellagio, so I don't know if they've switched. That's kind of a big deal if it's permanent. I just called Aria and the lady who answered the phone laughed at me when I asked if there was now free wi-fi everywhere. She explained that you must be a guest and you get an ID code when you check in. It's part of the resort fees, she said. Huh. If Aria really has freed up its Internet access, it would be marvelous and 100 percent thanks to John Unwin and Cosmopolitan. It also, however, would beg the question of why they need to charge so much (anything) for resort fees if Internet access, the most used perk of the involuntary cost of staying at an MGM property, is not among the privileges. It could also be a system glitch. So let's see where this goes. Is it possible they are using something like a cookie to identify a guest who has already logged in? If so, John may have logged in first earlier in his trip, and then it identified him afterwards by the cookie on his PC and allowed him to access the wifi network without re-authenticating. I'm speculating - I haven't heard of them doing this for wifi connections but I assume it is possible. I'm actually the John that wrote in. No, there was no cookie installed - I never had to login, not even the first time (and I cleared my cookies for good measure anyway). Also, I was able to use it throughout the property both on my iPhone wifi and my laptop without having to enter a single piece of information. Just clicked the Agree button and I was off to the races. It's interesting to note that this process is almost a copy of Cosmopolitan's process - in fact the screens are almost identical with the exception of the hotel logo. This is also a change from when I was at Aria in November when they did require last name and room number. I can't imagine that this is a coincidence. Aria may not be advertising it, as they don't want to be perceived as chasing a new neighbor just a few weeks into their existence, but it's there and it's changed since Cosmo opened.